New models are available in head and combo formats. NAMM 2019: Blackstar Amplification has added three new models to its HT series—the HT1R-Mk II, the HT5R-Mk II and the HT20R-MkII. The one-watt HT1R-MkII offers Blackstar’s patented ISF control, 4-16 ohm speaker output and USB speaker emulated output. New features on the model include two footswitchable voices, “American” and Class A “British,” as well as a USB audio output and newly-voiced studio-quality reverb. The five-watt HT5R-MkII boasts a push-pull two-channel design with two distinct voices per channel and USB audio output, as well as ISF control. New features include footswitchable voices for Clean and Overdrive, power reduction to 0.5 watts, a USB audio output, XLR D.I. out and newly-voiced studio-quality reverb. Both the HT1R-Mk II and the HT5R-Mk II are available in head and combo formats. The considerably larger 20-watt HT20R-MkII boasts one 12AX7 preamp tube and two EL84 power amp tubes, as well as clean and overdrive channels, a USB audio out, an XLR D.I. and a studio-quality reverb. The amp is also available in head and combo formats. The HT1R-MkII combo is being offered for $299.99, with the HT1RH-MkII head at $249.99. The HT5R-MkII and HT5RH-MkII are priced at $499.99 and $449.99, respectively. The HT20R-MkII and HT20RH-MkII are available for $599.99 and $549.99. 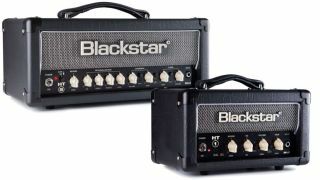 For more information, head over to Blackstar Amps.